The ride over Arthurs Pass includes some demanding climbs as well as exhilarating descents. Our ride descriptions give an account of the ride that we completed. As part of the description we also provide links to Wikiloc or Google maps and elevation profiles based on mapping data available through the internet. The ride profiles are smoothed to give what in our opinion is a more beneficial view of the profile. We use paper maps, GPS and on line data to plan and conduct our rides. We are happy for you to use our descriptions, but be aware that we do not guarantee the accuracy of the information provided as situations surrounding any ride change over time. With two weeks to fill before our flight out of Christchurch, we decided we had enough time to cycle over Arthurs Pass, the last route on our 'must do in New Zealand' list. It would be hard, not only because of the climb to over 900m, but travelling from east to west, we would be cycling into a head wind all the way. The steepest part of the road is the climb to Porter's Pass but we could take a gravel road up to Lake Lyndon to avoid this. 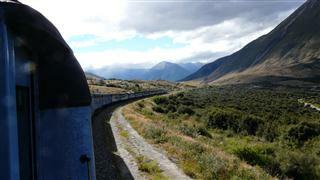 Once we got to Greymouth we would take the 'Trans Alpine' train back via Arthurs Pass to Christchurch. We were up early for the start of our Arthurs Pass ride in anticipation of a very hard day. After shopping for overnight food supplies and coffee in the internet cafe we set off. The road out of Methven was another of those long straight, slightly uphill ones that looks flat to the eyes but feels hard on the legs. It was 8 km before it started to drop steeply down into the Rakaia Gorge, a beautiful and welcome relief after all the miles through the plains. 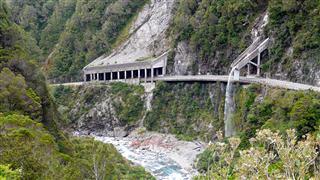 We had to travers this gorge and travel along it for some way before climbing up to the Arthurs Pass road. Of course, a long steep downhill into a gorge means an equally steep uphill on the other side and this was on a gravel road. 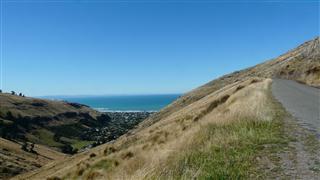 But at least it was quiet and with views across to the Mount Hutt and Torless ranges, the scenery was spectacular. The road climbed back and forth as we sweated our way upwards, eventually coming onto the sealed section to take us along the wide valley, above the gorge. It was then an easy ride of about 18km before we reached Lake Coleridge. The sky was cloudless and the lake was an unbelievable deep turquoise colour. Here we turned off onto another gravel road to up to Lake Lyndon which had a sign warning it was a 'good weather only' route. Luck the sun was shining. 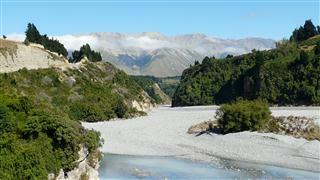 First though it was time for lunch and a paddle in the river, our first since Haast Pass more than two weeks ago. Back on our bikes the gravel road wound its way up the valley and it took us a good hour or so to reach the Lake. 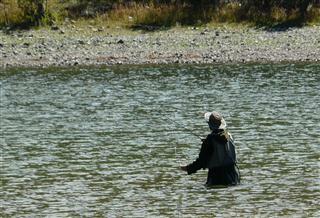 It was a peaceful vista with several fly fishermen casting for trout. A short ride along the side of the lake took us to the main Arthurs Pass road. As we were hot and tired we thought about taking a swim, but another couple that were already in their costumes looked pretty cold, so we decided against it. Instead we got back on the bikes for the last 20 kilometers to our camp site for the night at Craigieburn. 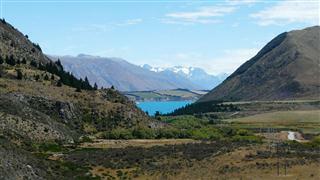 The Arthurs Pass road is initially in a broad valley with the hills and ski fields all around. The valley was crossed by several deep gorges which meant fast descents and steep climbs out the other side into the vicious head wind. Twice we had to get off and push up the steepest sections. It may have been because it was late Friday afternoon but the traffic here was awful. Lots of fast moving 4wd vehicles and large lorries who didn't want to give an inch of space. 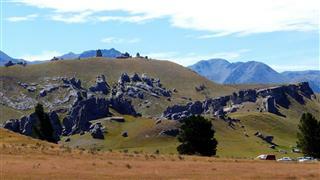 High, towering pillars of limestone rock and cliffs puncture the tussocky grassland giving Castle Hill its name. By the time we reached Craigieburn, we could hardly have ridden another kilometre. This was the hardest day yet since setting off 18 months ago. We rode into what seemed like a tranquil DOC site with toilet and stream freshwater. There were only a few other campers there and we settled in for a quiet evening, or so we thought. We pitched our tent in a small clearing by the stream, away from everyone else. Extremely exhausted, we went to bed early at around 10-00pm. Shortly afterwards we heard a vehicle pull in and drive further into the forest. There was lots of shouting and then the sound of deep base notes coming from a music system. We read for half an hour and it was still going on. Steve decided to ask them to turn it down. He walked up the path past the other campers to where the noise was coming from. A group of young men were stood around a camp fire with heavy house type music blaring out. After a bit of swearing they agreed to turn it down. Just as we were dropping off to sleep another car arrived and pulled into our little clearing with its headlights on full beam. The three German occupants then spent the next 90 mins pitching their tent and unpacking the car. They must have hammered in at least 30 tent pegs, slammed the car door 20 times and drunk at least 12 cans of beer in the process. Eventually after midnight peace descended and we got to sleep. Despite the late night, we were awake at seven to commence the final leg of the Arthurs Pass climb - but unfortunately so were the Germans, so there was no getting our own back by waking them up with a lot of noise. We still had blue skies and sunshine and a dry tent to pack. Steve's quote of the day, again painted on the back of a 'Wicked' campervan. 'If it swells.........ride it!' Obviously, he was thinking of his Brook's leather saddle. On the road by 9-00am the battle against the head wind commenced once again. A fresh north westerly was blowing up the wide Arthurs Pass valley making the slightest rise feel like a steep hill. The general trend however was downhill so for the first two hours we made good progress. We were tempted with the promise of coffee at the Bealey hotel but we had to climb a steep driveway to get to it. We met another couple of Dutch touring cyclists travelling in the opposite direction and they were complaining about having to push their bikes up Arthurs Pass. After the hotel the slow climb towards Arthurs Pass began. 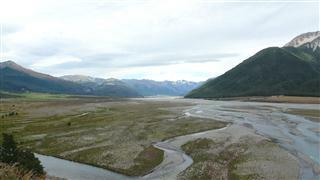 As we climbed up the Bealey river valley the road kept rising steeply to go over rocky bluffs and descending again. Entering the beech forest the road was more sheltered and although there were some steep rises it felt easier without the headwind. 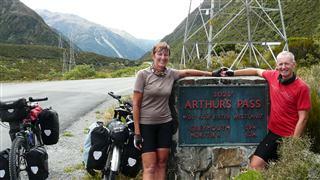 By 1-30pm we made to Arthurs Pass village. Outside the visitors centre we chatted to three Australian ladies touring New Zealand together. 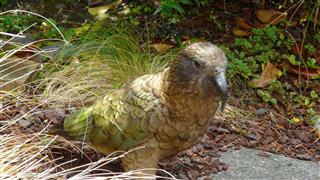 Lunch was taken at a cafe that had outside tables and two resident Keas. We had to keep a close eye on the bikes in case they took a fancy to our handlebars. They are very intelligent birds and despite all the notices asking people not to feed them they had worked out their own strategy for stealing food. They seemed to spot people with sandwiches in plastic wrappers and wait for them to start to eat the first sandwich. Whilst their attention was elsewhere they would swoop and steal the wrapper with the remaining sandwich. They had also worked out how to operate the outdoor drinking fountain so they had something to wash it down with. 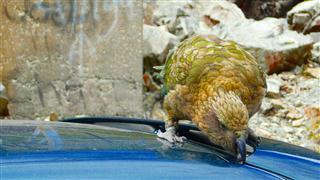 Later we spotted this one trying to eat someones car. After lunch we started the final climb up to Arthurs Pass at 920m. There was a short steep section, but it was surprisingly easy and when we saw the monument to Arthur Daley Dobson, who was the first European to travel it in 1864, we realised we had reached the top. 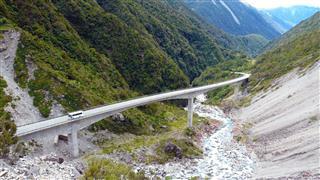 Once over Arthurs Pass, the road then dropped steeply into the Otira Gorge. There used to be a steep series of switchbacks up the valley side, but they have now been replaced with a modern viaduct. It was still a steep and fast descent under the rock shelter and onwards down the gorge. Steve got ahead and stopped to take a photo. Karen missed him and went sailing past, but Steve didn't see her. Each of them had lost the other. Karen was in front trying to catch up with Steve who was trying to find her. Not knowing whether Karen was behind or in front when he reached the bottom of the gorge Steve flagged down a passing car to ask if they had seen her. 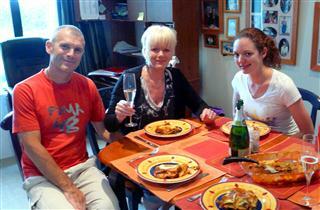 It was the same three Australian tourists that we had met earlier. They had not passed her and promised to tell her that Steve was on his way down. Oh what confusion! By now we had arrived at the Otira Hotel. In its early days the hotel had obviously been a very important staging post for the many horse drawn wagons and stage coaches that took passengers over Arthurs Pass before the railway was completed in 1923. Now it was a shadow of its former glory. The current owners had clearly been enthusiastic when they bought the place as their hotel history book showed, but they had lost interest and the place was run down, dirty and sad. Along with the rest of the village which they also own, it is now up for sale, although real buyer interest seems to be severely lacking. As soon as we got to bed, the wind increased and it started to pour with rain. Waking in the morning the rain had abated to a heavy drizzle and low clouds had obscured everything. We cooked our own breakfast, which seemed to please our host. We hung around to see if the rain would stop, but it just got heavier and in frustration we set off anyway. At least it was warm. The wind was fierce to start with but as the valley widened it eased a little, but the rain kept on. There was not view to see due to the low crowd and just kept our heads down, focussed on getting Greymouth no matter what. By 11.00am we were just a bit damp so we stopped for coffee and scones at Jackson's, another historic hotel. This one was nicely renovated and popular. After that the road went through the forest so was sheltered from the wind, but the rain became torrential and there were a lot of rolling ups and downs. After 60km we reached Kumara and had to stop to get some food. We were embarrassed walking into the cafe as we were so wet the rain was dripping off us and our shoes squelched. Luckily there was no-one else there so we quickly gobbled a pie and cake before we got too cold. The final 20km to Greymouth were flat and for a while it actually stopped raining. We got to the Neptune hostel, another converted hotel, stripped off our soaking gear and jumped into a hot shower. A pint of beer and a meal in the local Indian was all we could manage. Monday dawned and still the rain teemed down. 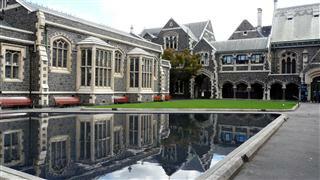 We booked another night in the hostel and brought our Arthurs Pass train tickets for Tuesday. Later that afternoon the sun came out and we went to the station to pick up the tickets. We discovered that a landslip had closed the line between Greymouth and Otira and we would have to go in a bus up to Otira before catching the Arthurs Pass train, which after Otira disappears into a five mile long tunnel. Not quite the trip we were looking forward to. The day dawned and we packed our gear ready for our journey back to Christchurch. We passed the morning idly and arrived at Greymouth Station at the appointed time. It seemed that all the tour buses from all different directions were arriving at once. There were people milling about, changing buses, catching taxis, waiting for the train, or onward journey somewhere else. The bus was due to depart at 1-45pm. 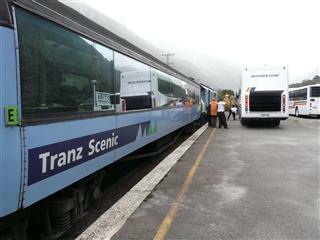 There were about 180 people to transfer from Greymouth to Otira to catch the train. The buses arrived late and by the time everybody's luggage was loaded and we were all on board it was gone 2-30pm. The bus took the same route that the train would have taken, following the Grey River valley and along the side of Lake Brunner. Despite being on the bus rather than the train, it was still a pleasant journey through picturesque countryside. At Otira the buses drove straight onto the platform and within 30 minutes the transfer to the train was complete. You have to stay in your seat for the first 20 minutes as the train goes through an 11 kilometre long tunnel. Shortly after entering the tunnel a door closes behind the train and large extractor fans remove the diesel fumes. 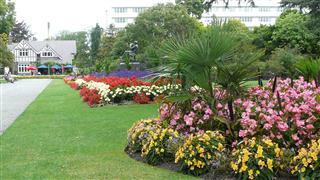 The museum, arts centre, gallery and botanic gardens are worth visiting, not least because they are free. 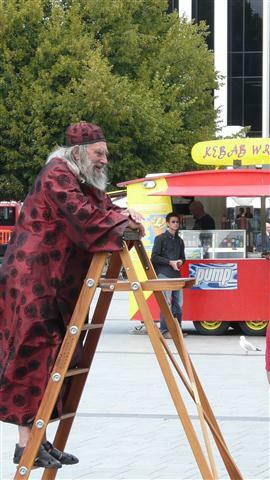 Preparations were under way for the annual flower festival in the cathedral and the town wizard was busy preaching to the crowd. In the square a large crowd were watching the latest chess game. On the other side of the tunnel we came into Arthurs Pass village and for the next few miles the route runs by the side of the roads that we had ridden down a couple of days earlier along the Waimakariri valley. At Cass the track turns away from the road and runs along the spectacular Broken River Gorge, which is famous for its viaduct and having 6 tunnels in one mile. The only access to the gorge is via the train, (there are no roads) and while the track was being built, the families of the rail workers lived at the end of the line in shanty town accommodation. 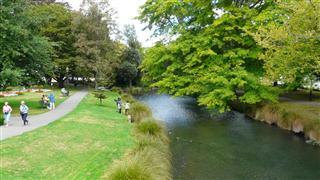 The water from the Waitamkiriri River is the source of the pristine, untreated water supply to Christchurch. The Express arrived in Christchurch only 40 minutes late. 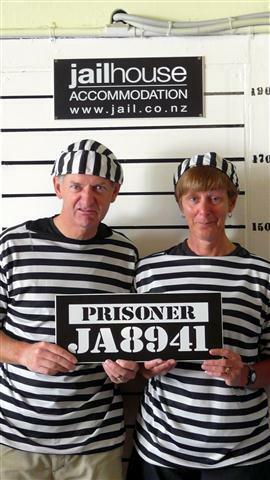 We had booked into the Jailhouse, just a few minutes ride from the station. 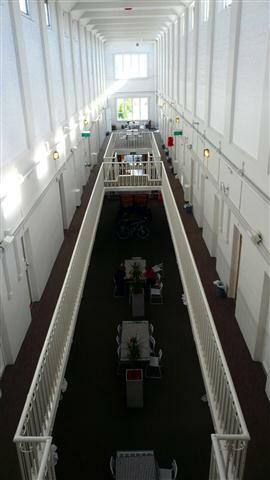 The Addington Jail was converted into a backpacker's hostel after it closed in 1999. Guests (inmates) stay in the converted cells, complete with the original thick steel doors. The "prison" theme is perpetuated throughout the place with striped bed linen, tablecloths, crockery and the staff are called wardens. The backpackers who work in the hostel are called prisoners and have themed T shirts. We were held there for four nights before we managed to negotiate our release. 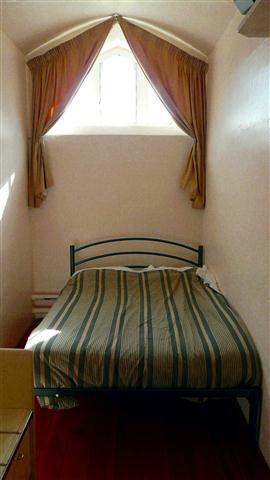 The hostel is well managed, clean and quiet (at the right times). It was one of the best places that we stayed at in New Zealand. It was very popular with all age groups and nationalities. 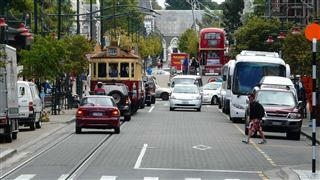 Christchurch turned out to be a great city for cycling with lots of cycle lanes and dedicated paths. The town was built in the English style with lots of brick and stone buildings. The river that runs through the centre is called the Avon and you can ride on it in a punt if you wish. Unfortunately, many of these lovely old buildings (as well as the newer ones) showed signs of earthquake damage and there was a lot of rebuilding work going on. One day we rode over to Lyttleton. In the early days of colonisation, it was established as a harbour and is a still an important port for the export of coal and timber. Here too, many of the lovely old building showed similar signs of earthquake damage. It was a nice sunny day and after eating lunch listening to a jazz band we cycled along the coast to Corsair Bay for a swim and a welcome lie on the beach. Our final days in New Zealand were spent with friends Chrissy and Tony at their lovely house just outside Christchurch. We packed the bikes ready for shipping and arranged our accommodation for Sydney. The evening before we were due to fly we logged onto Oz government web site to find out what food we could take into Australia. After realising that we could basically take nothing including tea, dried herbs, etc we idly looked at the visa requirements and were shocked to find that Australia has a visa before entry requirement for UK citizens. Our fading memories told us that we had both checked this previously, but we can't have done as it appeared this had been the case for over two years. The automated application for the government site enabling immediate visa clearance wasn't working. Severe panic set in. We found a UK agency and applied on line through them for a fee of 20 UK pounds each!!! Karen's application was approved immediately, but for some unknown reason Steve's was put on hold. Panic level increased to severe level 6!!! All of the what if scenarios started playing out in our minds. That night we waited up to phone the office in the UK, assuming it would open at 9-00am. The answering service informed us that they didn't open till 10-00am, so we would have to leave it until morning. As we sat there in bed Steve looked on line one more time. Lo and behold, his application had been approved. The relief factor sent the panic level into nose dive and all was well in the World. The following morning we packed our gear in a somewhat melancholy mood, sorry to be leaving New Zealand after 4 months, and also not quite knowing quite what to expect in Australia having heard very differing views. The airport shuttle arrived on time and our journey to the airport was uneventful. There was no queue at check in, but when it came to our luggage they tried to charge us $600+ excess baggage. Steve protested and the error was quickly corrected when they realised we were on round the World tickets via the US. We dropped the bikes at the oversize luggage conveyor, passed through security and relaxed with a beer as we waited for our flight. Just before boarding we heard our names over the public address system. The security were holding our bikes as their scan had shown our stove fuel bottles. They wanted permission to open them and if they smelt of fuel they would not be allowed on the plane. The worst case occurred and we flew out of NZ minus our stove pump and fuel bottle. Grrrr!!!! After 4 months in this fascinating country it was goodbye to the land of the long white cloud and hello to the land of corked hats, kangaroos, cobbers and sheilas. 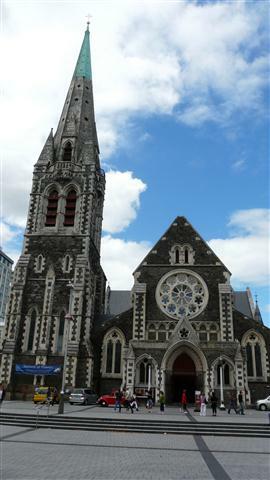 A week after arriving in Sydney, Christchurch was hit by another devastating earthquake. We cried to see all of the lovely places that we had seen in ruins and prayed for those who had lost their lives, loved ones or their homes. Christchurch will never be the same again.